Would you groom your colleagues to diffuse tensions at work? If humans behaved more like their chimp relatives they might be better at communicating, say experts. Scientists at the Zoological Society of London are looking for volunteers to "talk chimp" in their everyday work and home life to test out the theory. One part of the survey recommends waving your arms, brandishing objects and making yourself appear large, to assert authority over others. Volunteers can also bond with their group by grooming each other. Chimps are our closest living relatives and share a variety of similarities, not only in genetic make-up but also in expression and behaviour, said ZSL. Animal behaviour experts want to see how "primate patter" can resolve workplace conflicts, express emotions and strengthen human bonds. 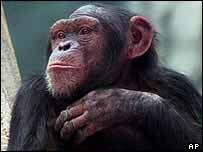 Volunteers are expected to replace their usual human reactions with chimp behaviour, and report back on how it worked. Instead of bitching about your terrifying boss behind their back, try showing them your fear by baring your teeth and using submissive body language such as lowering your head and crouching. A simple hello when greeting friends should be replaced with an extended arm and throaty "huh huh huh" pant. 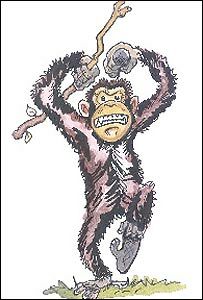 Organisational psychologist Professor Cary Cooper told BBC News Online that anyone willing to try it could learn a lot from our chimp cousins. "What I love about this as a concept is that people don't communicate enough to one another. "What they communicate is words, not feelings, so this kind of thing would give them access to their emotions." He said a hierarchy similar to the animal kingdom already existed in the workplace, even though it is not always acknowledged. "We should not be aggressive towards those in authority, as animals can be, but we should express our feelings. "Animals are more tactile and supportive, and very much a community. Unfortunately the workplace is seeing less of that these days," he added. The research, launched on Wednesday, coincides with the opening of ZSL's new chimp facility at Whipsnade Wild Animal Park. The charity is investigating these similarities so they can to communicate better with chimps and to see what can be learned about communication between humans. It is hoping for at least 100 volunteers to take part in the study, which can be downloaded from the ZSL website. The results will be analysed and included in a report to be published later in the year.